Marshall Andress began his company, Andress Electric, with a passion and a dream to become Lakeland’s most trusted electrician. Through his commitment to excellent customer service and an unmatched quality and knowledge, he’s quickly turned his dream into a reality. Marshall approached Barrett Creative because his site, created by a phone book company, just wasn’t generating the leads and quality prospects he was looking for. We always love challenges so we immediately went to work. We took into consideration the objectives we have when we’re trying to contact service providers so we created a really easy to use Call to Action bar beneath the top level navigation. 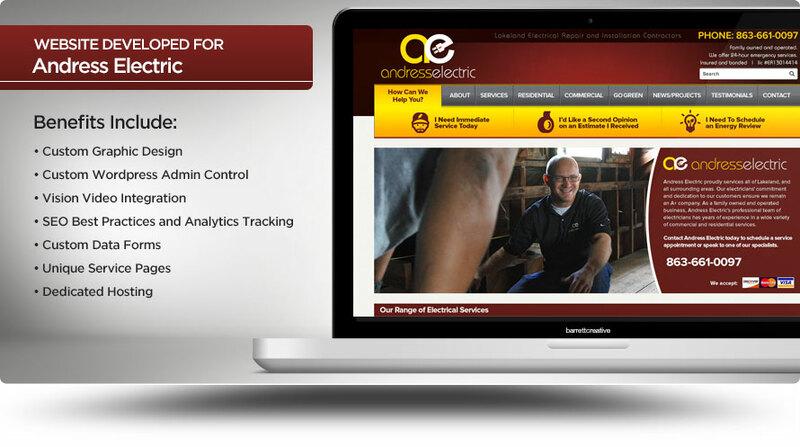 That means when someone needs electrical service or is interested in hiring Andress Electric, they don’t have to scroll, click a bunch of links or jump through hoops to contact Marshall quickly and easily. We also created a beautifully clean design to highlight his services and unique offerings. In the background, we created an incredibly user friendly content management system where Marshall can effortlessly add, update or edit any content he wishes. We created multiple contact forms based on the viewers specific needs and created unique pages for each of his services offered followed by a visibly engaging Call to Action because we know that’s the main thing we want his users to do…contact him. On the search engine front, we created the site with SEO best practices (we do with every site we create) which means your site is really liked by Google and other search engines. Kevin added his special touch to the URL structure, title tags and header content and a few other secret things he’s great at doing. An additional service we provided Marshall with was a Mission Video. Marshall has a great personality and we thought it would be powerful to allow his potential clients to connect with him and hear his passion and work ethic for what he does. Watch the video here. Why we’re different from other companies? We know that the key to any successful business is relationships, which is why outstanding service and delivery on each project is our main objective. You can count on us to be honest, dependable and fun to work with. We love what we do and our passion shows through our work. Ready To Get Started With Your Web Project? We’ll make it incredibally easy for you to begin.